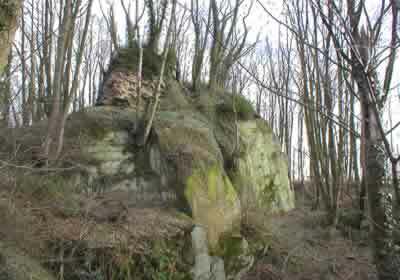 Horston Castle was a Norman earthwork motte and bailey fortress, founded by Ralph de Buron. In the 1200s, King John founded the stone castle, when adding a keep, a chapel, a gatehouse and a barbican. Sadly the castle has been completely dismantled and disturbed by quarrying, with the only substantial remains being of the keep, which is defended by wide deep ditches to the north and east. Built into a boss of rock, which stands against the steep banks of the Bottle Brook, the most prominent features, are a fragment of wall with a sloping plinth and the remains of an angle tower, with a square mural chamber. The site has a dense cover of trees and is best viewed in winter. 3 miles north-west is Duffield Castle and 3 miles south-east is The Mound, Morley Moor. Horston Castle is located in woodland, off Sandy Lane. 6 miles north of Derby, on the A61-B6179. The site is visible from a public footpath, which passes the castle from Sandy Lane.